Pull a list of free signups for the previous day or week from your CRM or analytics service. You can make sure you’ve reached out personally to any new users who work at a company with more than 20 employees. Remember that only 2% of sales happen at the first meeting, so this is a great chance to learn more about the lead and what you need to do to upgrade them to a paid plan. Mailchimp showed that personalizing email subject lines, especially with both first and last name, dramatically increases open rates. After you run your mailing list through StackLead, you’ll have a complete list of names that you can use to personalize every email. In the early development stages of a new product or feature, it’s important to identify who is using your product and why. For example, your product could solve a problem for the marketing department, but be installed by the sales ops team. If you’re trying to understand your most active accounts, you can segment your users by role with StackLead. 1) Install the Add-on from the Google Add-on Store. 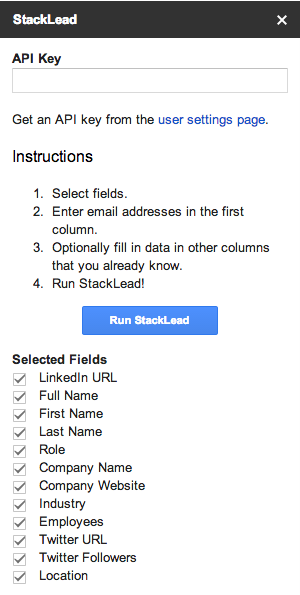 2) If you haven’t created a StackLead account, register here. 3) Once you have have an account, copy your API Key from the Settings page and add it to the StackLead sidebar of the Google Spreadsheet. You can also customize what fields are most important for us to return – from the StackLead Score to Twitter handle to Alexa rank. 4) Copy the list of email addresses you want us to research into the “Email” column. Our Free plan supports up to 50 emails and you can check out our other plans on the Pricing page. The Email column is the only one that’s required, but if you include other details (e.g. name or location), it’ll help improve our research results. We’re excited to be a partner in the Google Add-ons store. Head there to supercharge your email lists with StackLead research. Questions? Send us a note at team@stacklead.com.